The Celtics currently do not own a second-round pick in the upcoming NBA draft, but buying one, particularly in the early portion of round two may pay dividends. There are a number of players that could remain on the board by the end of the first round that could have real value for a team looking for effective role players. Boston was able to draft Semi Ojeleye in the second round of the 2017 draft with pick #37 overall. 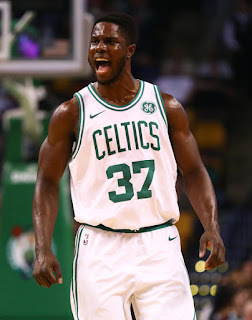 Ojeleye was originally projected to be drafted in the first round, and Danny Ainge did not hesitate a bit when he was still available at #37. Semi turned out to be one of the Celtics top defenders in his rookie year and played an important role both in the regular season and the playoffs. The first 15 picks are not too difficult to predict, but the second half of the first round can be a crapshoot. Particularly in this draft, players that Danny Ainge views as solid rotation guys will still be around in the first half of round two. De'Anthony Melton, Bruce Brown, Jalen Brunson, Elie Okobo, Omari Spellman and Khyri Thomas are just some of the possibilities. Another is Billy Preston, a player that the Celtics are expected to work out today. No one has any idea where Preston projects in this draft. The Celtics announce they are working out (among others) Grayson Allen, Billy Preston and Allonzo Trier today. With the #27 pick and another in the low 30's, Ainge could possibly acquire two rotation players at low money. Or, if during the draft he saw a desired player falling, he could attempt to trade the Celtics two picks for one pick in the high teens or low 20's. It simply gives him more chances for success. Semi Ojeleye is scheduled to earn 1.4 million this coming season and 1.6 million, with a team option, in 2019-20. With significant improvements in his offensive game over the summer, that could be a real bargain for Boston. Ainge may be looking to duplicate that second-round-gem find in this year's draft. I am quite sure he is already attempting to buy into the second round.